Mother’s Day is nearly here, which means that it is time to think about some DIY Mother’s Day gifts and cards. I wanted to do something for children, especially. So, I looked and found 25 of the most adorable DIY Mother’s Day cards that kids can make. Whether you’re Dad and helping your little ones to make Mom a wonderful homemade card on her special day or you want to do something special for a grandparent, stepparent or any other mother, these are the cutest cards ever and easy enough for even toddlers and preschoolers to make. Some of these do require a bit of adult supervision, but most of them are really simple. All of them are adorable! From themed cards to seeds, sundaes and raisins, there is definitely a card in here that your little ones will want to make. If you love DIY gifts, you need to be sure to take a look at these 50 fabulous Mother’s Day gifts that you can make for under $20. There is something in here for everyone, and these pair perfectly with a DIY Mother’s Day card! I love doing special things for my Mom on Mother’s Day and I am sure that you do, too. I remember making cards in school when I was young, and these DIY cards fall along the same lines. Teachers, if you need inspiration for your class for Mother’s Day, these cards are perfect! You are sure to find something that your kids are going to want to make for Mom this year, and many of these require very few supplies. And, if you really want to do something special for Mom, check out these 15 delectable Mother’s Day desserts and surprise her even more this year. This little photo book is the perfect card for Mother’s Day and little ones can make it almost all by themselves. If your children are a bit older, they won’t have any trouble with this one. For toddlers and preschoolers, you may need to help them with part of the folding and gluing but they can pick out the pictures that they want to include and even draw on special pictures for Mom. 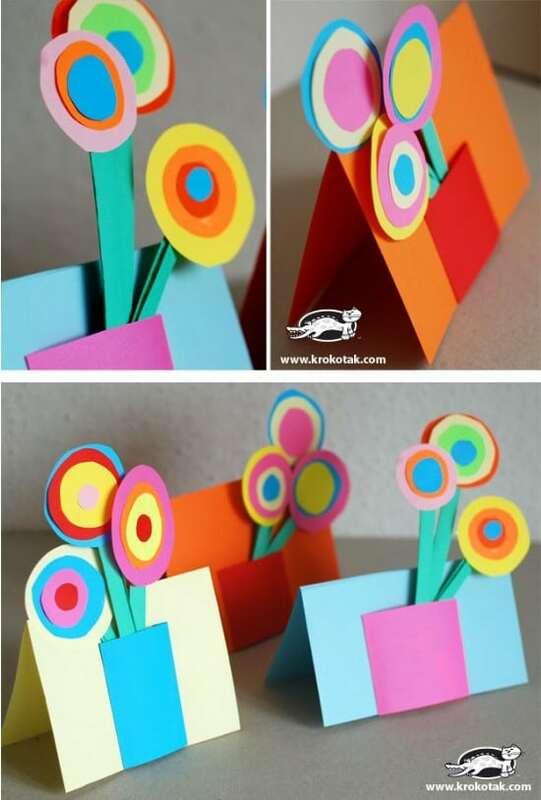 Your little ones will adore making this pop up flower card for their Moms and Grandmas. It is a really simple and very colorful flower that kids will adore and aside from cutting out the flowers, little ones can make this one all on their own, depending of course on their ages. They can create flowers in any color or combination of colors that they want. These little flower pot cards are really adorable and they include pictures of the little ones. 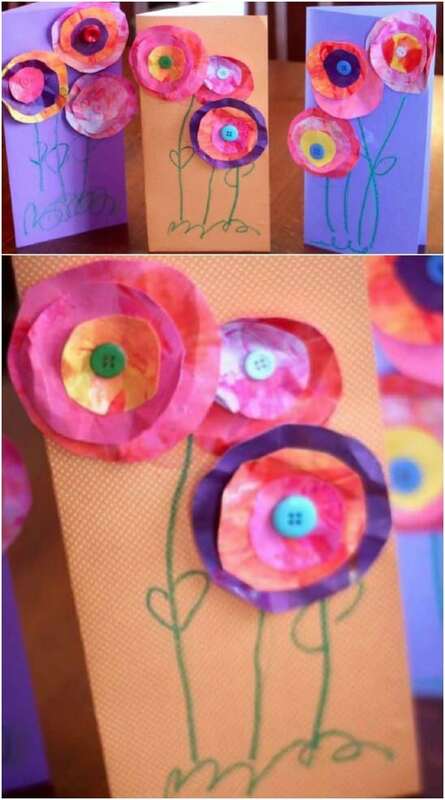 You could have all of your kids make one card together and add a picture of each of them in the flowers or let each child make their own flower pot card. 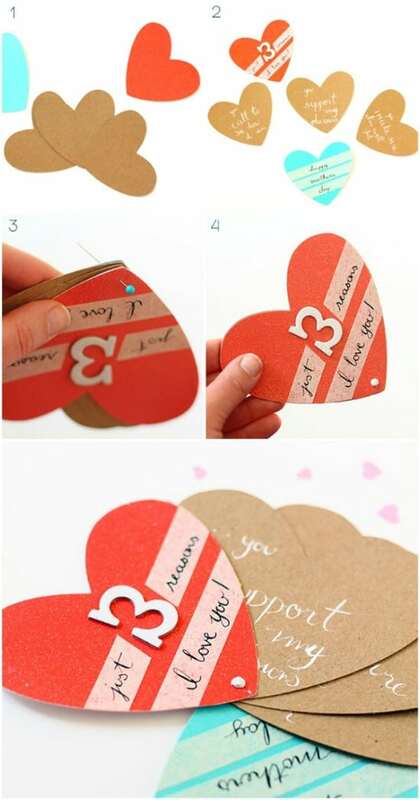 These are so simple to make from construction or craft paper and Moms are going to love the personalization. You could even use the cards and pictures to make Mom her own picture frame tray as a nice Mother’s Day gift. Let your little ones create their own flowers for their Mother’s Day cards with tissue paper. Once you cut out the paper, even toddlers can put together their adorable little flowers in any number of color combinations. They can glue on buttons for the center of their flowers and then draw on anything they want inside the cards – which are made of construction paper or craft paper. 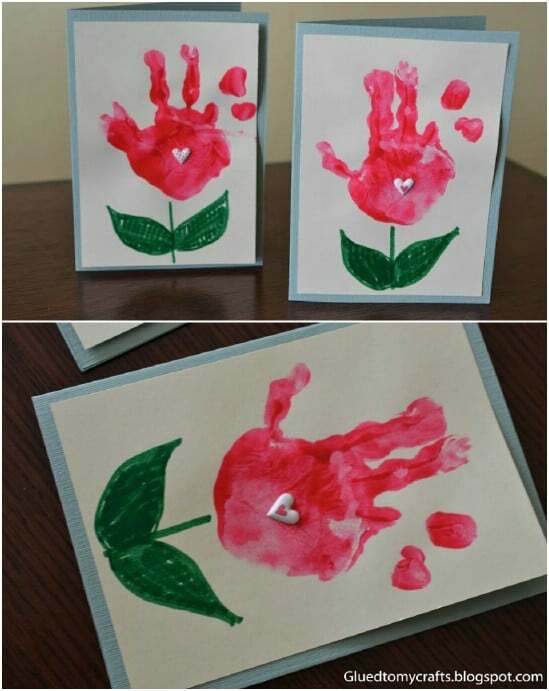 Moms will love receiving these little handprint flower cards for Mother’s Day…almost as much as your kids love making them. These are so easy and let’s face it, kids love putting their hands in paint so getting them to make these is going to be a cinch. Once they have stamped their handprint flower, they just add whatever other decorations they want to finish them off. Here is another great Mother’s Day card that looks like a flower pot. This one doubles as an envelope for your card. The flower pot keeps the card in place until Mom pulls out the flowers, and little ones can write or draw things on the enclosed card to make them more personal. These are pretty easy to make, even for younger children and can be done in so many beautiful colors. Help your little ones to print off these adorable M&Ms cards for Mom. Once you have the printable done, you just attach it to a bag of M&Ms. These are super easy, even for toddlers and Mom will love having her own little bag of chocolate. If your kids want to do something more personal, have them write a special message on the back side of the printable so that Mom sees it when she takes it off of the M&Ms. 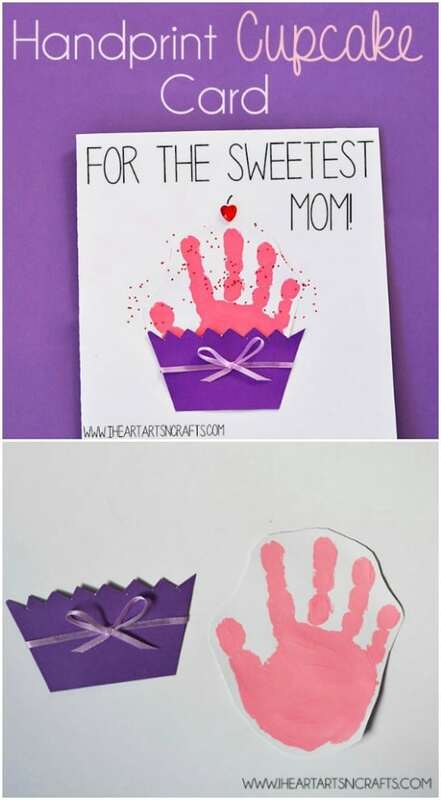 Here is a great idea for a Mother’s Day card – it’s a handprint card. Moms love getting their little ones’ handprints. This one is really cute. It makes a cupcake and you only need a handful of basic craft supplies to make it. Plus, kids love putting their hands in paint, right? They will adore making this card as much as Mom will adore receiving it. Take an empty plastic bottle and turn it into a beautiful stamp to create your Mother’s Day card. 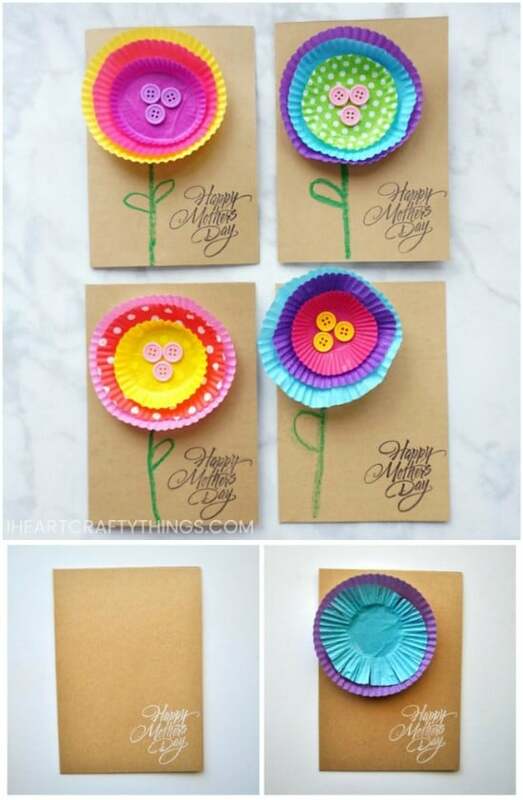 The plastic bottle can be dipped into paint and then stamped on a card to make flowers. Kids are going to adore stamping their little flowers onto the cards and then they can draw in stems, leaves and anything else that they want. This is a fun craft for upcycling plastic soda bottles. You can make this adorable little Mother’s Day card out of foam or just regular green card stock. You make this one by tracing the handprint of your little ones – or letting them do it themselves. The handprint serves as the stem base for all of the little flowers. This one is super easy, even for toddlers, and it is adorable when it is finished. 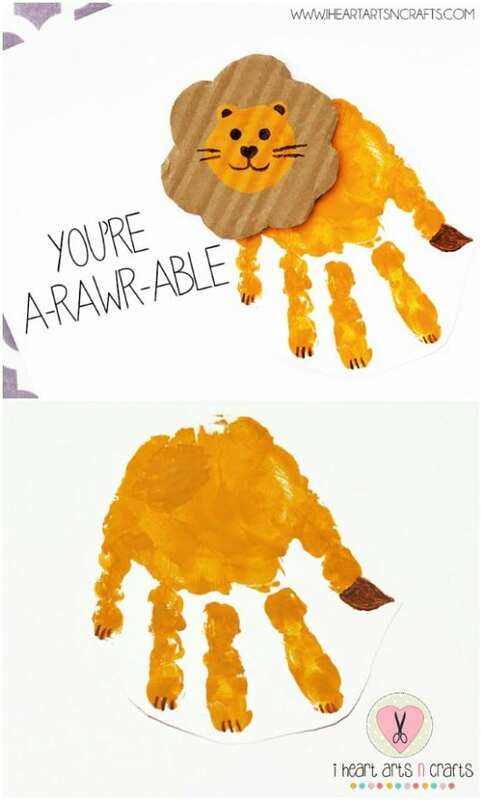 How adorable – or a”rawr”able – is this Mother’s Day card. You make this with a handprint and it couldn’t be more precious. A piece of recycled cardboard makes the mane and your little ones create the lion’s body with their handprint. You need a few paint colors, cardstock and some basic craft supplies for this one and it’s easy enough for toddlers and preschoolers to do on their own. This little card is so easy to make that even your preschoolers and toddlers can do it pretty much on their own. I love the message – “I whaley love you”. How cute is that? You just need card stock, some blue paper and glue to make this one. Plus, they can fill out the inside of the card however they want with crayons or markers. Your kids are going to love making these cute little cards with cupcake papers. You just use the cupcake papers to create the flower petals and this is a really simple step. Even your youngest can handle this one on their own. Let them pick out their favorite colors or patterns from cupcake papers and then they just glue them together to form a flower. 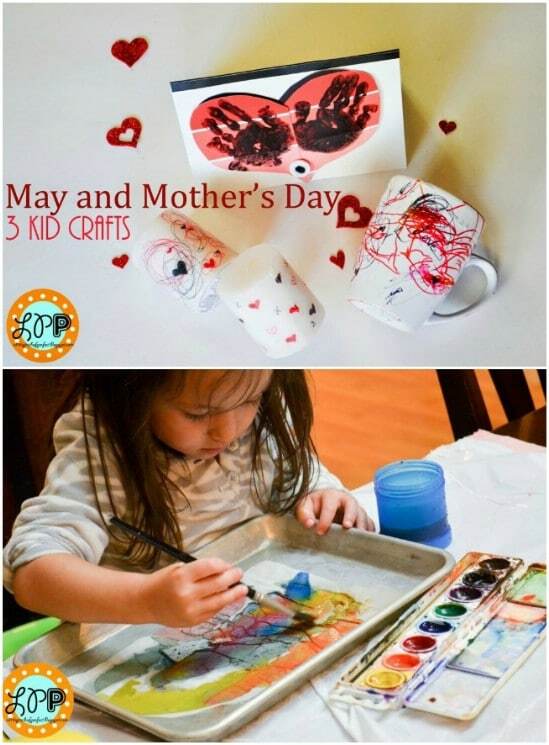 This DIY Mother’s Day card is a bit more complex than some of the others, but even your youngest can make one of these with a little help. You need to cut out heart shapes and then let them fill those shapes in with pictures or whatever messages they want to convey. Then, help them to put all of the hearts together with a brad and the card fans out when it’s finished. Okay, so this one isn’t technically a card, but little ones can turn it into one. Just have them put in a message on construction paper or cardstock and then they can create the frame to showcase that message. They can also add a picture of themselves for Mom’s desk or dresser – it’s a really easy DIY project and kids are sure to love making this one. Toddlers and preschoolers can make this card all on their own, and older children can customize it however they want. This one is super simple. You just have your little ones create tulips origami style, which is really simple. Then, they just glue those tulips to card stock and add whatever Mother’s Day message they want to add. They could also make DIY book page roses for this card if they prefer. 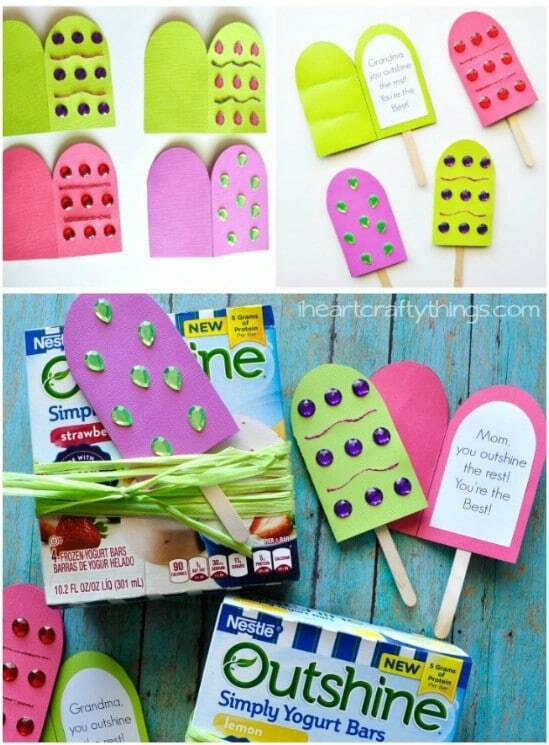 These little yogurt bar Mother’s Day cards are really cute and super easy to make. There is a free printable that you can print off and then just let your little ones decorate their yogurt bar cards however they want. The cards open up to reveal a special message and you can help toddlers and preschoolers to glue on a popsicle stick for the actual stick. 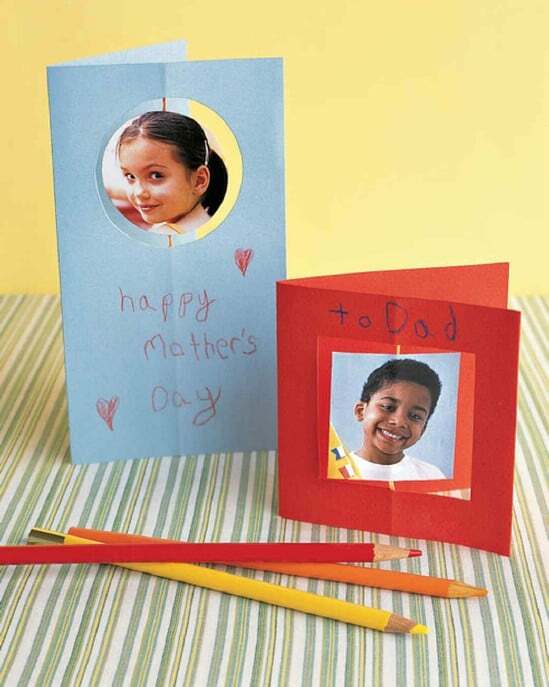 These little cards are made with paint chips, which are really inexpensive, and they have a hidden surprise for Mom right inside. These are really easy for younger children to do, as long as you help them to assemble the cards when they are ready. Plus, any time your little ones get to stick their hands in paint is a great day for them, right? This is a really simple card to make, even for toddlers. You just need card stock, a cupcake liner and a few hearts cut out of construction paper or foam. You can buy premade hearts at craft stores or the Dollar Store to make it easier for your little ones to make this one. 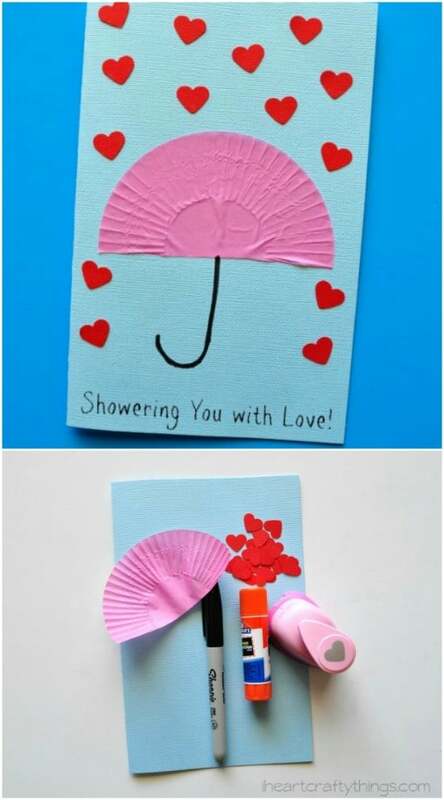 The cupcake liner creates an umbrella and the hearts are the “showers of love”. How cute is that? This is a really cute idea. It’s a card with grapes and the grapes are made with the thumbprints of your little ones. Just let them dip their little thumbs into purple paint and stamp on their grapes. Then, you can help smaller children to paint on the stems and write their message of “I love you bunches.” They can color or write anything that they want inside the card, too. These little spinning Mother’s Day cards have pictures of Mom’s favorite little ones – that spin! These are pretty easy to make. If you have younger children – not yet in school – then you may need to help them with the cutting and the placement of their spinning picture. They can do the rest though, and even put a special message for Mom inside the card. Kids love string art – at least I did when I was younger – and they will adore making these string heart yarn cards for Mom on her special day. The card part is really easy. You may need to assist younger children with getting the hang of string art but it’s a pretty easy craft and they are going to love watching their heart form while they thread the yarn through the card stock. This is a great leftover yarn craft. Here is a cute little Mother’s Day card that is easy to make and gives Mom a special treat on her special day. This sundae card is just card stock that kids can print messages on or write them on themselves. On the card are little baggies that hold Mom’s favorite sundae toppings. Let them create these cards and then have ice cream on standby for dessert. Mom can use her card to make her own Mother’s Day sundae! This cute little turtle card is made with card stock and some green cupcake papers. It is super easy even for toddlers and bears an adorable message – “I turtley love you.” You will also need yellow or brown construction paper to make the faces and legs of the turtles. Little ones will find this one so easy – they just fold the cupcake papers in half to create the turtle shells. This Mother’s Day card is perfect for your kids to make, no matter what their ages are. They just cut out circles of colored construction paper and then glue those circles together to create flowers. Then, add those flowers to a piece of card stock and let them draw in a vase or a flower garden. It’s so easy and Mom will love how colorful these DIY cards are.